Company: Data Access Europe B.V. This class makes it possible to create a grid in which one column (user definable) shows a checkbox to indicate whether the current row is considered selected or not. The standard grid behaviour is changed so to make it possible to toggle the checkbox from true to false and vice-versa when the user clicks anywhere in the row. The best part is, that it is fully IDE-compatible. 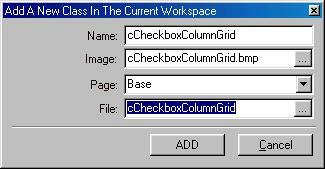 Here's a screenshot of an example (included) with the adapted grid class in action. Following are the steps needed to include this package into the order entry example. These steps will create the subclass locally into the order entry workspace, but you can always change this to your global settings. - Copy the .dfc, .dfo and .bmp files to the Order\IdeSrc folder. - Select Add and the new class is registered into the IDE. That's it, now you can use this new class from within the IDE. The following steps are included for the ready made example that is included. 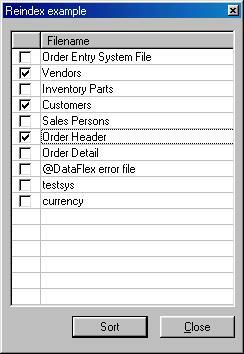 - Now click on the prompt button of item package name and select the file Reindex.dg. This componnent was created using the IDE. This means that the IDE will fill in all the rest of the necessary info. - Open the program 'order entry sample application'. - Compile the program and run it. Press the keys <Alt><R> to invoke the example.